The Naval Diving Unit (NDU) is a special forces unit of the Republic of Singapore Navy, and is regularly tasked with salvage operations, underwater mine demolition and commando-type warfare. The Naval Diving Unit (NDU) began with the British government's directive to withdraw her forces east of the Suez in 1971. Prior to that, a unit called the Far East Fleet Clearance Diving Team was operating from the old Terror Camp premises where NDU now stands. This unit basically supported the strong British naval presence in Singapore. When the Royal Navy left on 12 December 1971, the Far East Fleet Clearance Diving Team was replaced by the SAF Diving Centre which comprised a small group of local divers tasked to look after the naval assets belonging to the then Maritime Command. In 1975, the SAF Diving Centre became officially known as the Naval Diving Unit. Initially, the main task of NDU was to carry out simple underwater tasks like hull checks for the Fleet. As the only public diving capability available in Singapore, divers were and still are called upon to conduct civilian diving recovery tasks. The NDU of today had its origins in the mid 1980s when it was realised that underwater explosive ordnance disposal (EOD) and keeping Singapore's waterways open were vital. The RSN Fleet had also grown significantly and more divers were now needed to support ships in harbour and on overseas deployments. While the NDU of the 1990s is almost totally unrecognizable from its humble beginnings, traces of the NDU's history can still be found, such as the British 10-man chamber now with the Naval Medical and Hyperbaric Center. In NDU, Full-time National Servicemen (NSF) and regulars are expected to undergo the same training before they are qualified to become Frogmen. Recruitment begins with a vocational assessment, whereby NSFs are selected among the thousands that enlist each year. During the primary stage of selection physical fitness results and medical records are evaluated. Thereafter, an aptitude test is conducted by Applied Behavioral Sciences Department (ABSD) to gauge the recruit. Perfect eyesight is a requirement, which explains the absence of people wearing spectacles in NDU, and tip-top health condition, not suffering from any chronic illnesses that might jeopardize their training, such as asthma. The selected few will then undergo a battery of tests that include water confidence in a chamber and psychological evaluation. Those who meet all of these stringent requirements will then be selected to join the NDU. NDU operatives holding with the SAR-21 rifles during a training exercise with operatives of the US Navy. NDU operatives in boarding exercise aboard the U.S. Coast Guard. The unit logo shows the various capabilities of the unit. The traditional diver hard hat framed by the National Symbols of the Lion and the Tiger shows that the NDU is the only unit in SAF that specialises in diving. The background shows a buoyant mine with three mine horns. The lion, tiger and hard hat is in the foreground, symbolising NDU's ability to overcome and be ahead of threats. The three strips of colour waves represents NDU's ability to operate on land, at sea and from the sky. It is also indicative of the support that NDU provides to the Army, Navy and Air Force of the SAF. The logo is a resonant of the motto "Nothing Stands In Our Way". The motto was adopted in 1995. It brings out the "can do" and daring attitude of the divers and also highlights the important part that NDU plays in the Sea Lines of Communications removing obstacles that may impede safe passage of shipping. To provide solutions to the Navy and the SAF through maritime special operation teams. As a provider of naval divers capable of exploiting the sea, air and land dimensions, we aim to be the foremost choice of the SAF when maritime special operations teams are called for in defence of Singapore's national interests. I will swim faster, run further and fight harder from the sea, air and land. I will fight with all my might and bravely overcome the enemies in defence of my land. I will be bold and daring with an unwavering 'will-do' attitude. I will carry out my duty with HONOUR and INTEGRITY. I will care for my team mates and I will never leave a fallen comrade behind. Loyalty, Courage, Integrity and TEAM SPIRIT distinguish me. I am a Naval Diver, Frogman from the Sea. NOTHING STAND IN OUR WAY! Hooyah, for us, Don't Quit! As an elite Frogman of the Navy, I will swim faster, run farther and fight harder from the sea, air, and land, than any other soldier. Loyalty to unit and country, devotion to duty and personal integrity shall flow in my blood stream. I will always keep myself physically strong, mentally alert and morally upright. My courtesy to superiors, my neatness of dress and care for equipment will be exemplary for all. I will fearlessly overcome the enemies, because I am better trained. My methods will be aggressive, daring, unorthodox and innovative. I will fight with all my might; raw grit and the will to succeed are my hallmarks in battles. I fight as a team. I will not shirk from any duty and I will shoulder more than my share of task, whatever it may be. I fight first and blaze the path into battle for others to follow. Never will I fail my team. I will always remember the sacred trust I have in the lives of the men I accompany into battles. I will never leave a fallen comrade behind. I will press on to accomplish my mission with fortitude though I be the lone survivor. I am a fighter. Hooya! Frogman School: This is where trainees undergo highly specialised training required to become elite Frogmen. Here, they undergo nine months of gruelling training, including Basic Military Training (BMT), Land Combat Training (LCT), and the Combat Diver Course (CDC). Advancing through the different stages, an increasing number of trainees drop out as they are unable to keep up with the intense physical and mental demands required of them. Trainees are increasingly deprived of sleep as the training goes on and numerous vetoes are set in place which trainees are required to pass. Vetoes include timed run, sea swim, Individual Physical Proficiency Test (IPPT), etc. This training culminates in the final evolution, Team Building Week (TBW), more commonly known as Hell Week. It is a five-day intensive and consistent physical training phrase where sleep deprivation and non-stop mental harassment are commonplace. Only the most motivated and dedicated trainees, who exhibit outstanding teamwork and spirit are allowed to pass this final test. By the end of the 9-month training, as many as 50% of the initial batch will have left the course. Following this, they are sent to either the Underwater Demolition Group (UDG) or the Clearance Diving Group (CDG). Underwater Demolition Group: The Underwater Demolition Group (UDG) is where the bulk of the National Service trainees go, and further training takes place here. Here, divers are sent overseas for further training and upgrading of skills. The UDG ensures nothing gets in the way of the Navy's mission, combining their mastery of combat diving skills with expertise in underwater demolition to clear any underwater obstacles. Clearance Diving Group: The duties of the Clearance Diving Group (CDG) is to help preserve the safety of Singapore's vital sea lanes. As part of the Naval Explosive Ordnance Disposal (EOD) unit, the CDG work closely with mine countermeasure platforms to conduct hull checks as well as clear mines and war relics. CDG also form an integral part of Accompanying Sea Security Teams (ASST), by boarding and searching ships that carry highly sensitive material through Singaporean waters. Special Warfare Group: The Naval Diving Unit's Special Warfare Group (SWG) consists of elite maritime warriors. It is an all-regular unit created as a counterpart to the Army Commando Formation's Special Operations Force (SOF) starting off under the name "The A-Team" in 1987, armed with expertise in conducting highly complex operations and the ability to operate over land, air and sea. Together with state-of-the-art weaponry, and a highly trained team, the SWG act as a force multiplier for the Navy. The best candidates from Special Forces Qualification Course are selected to attend the Special Warfare Course before being inducted into this unit. Members train with various foreign units, and may also attend the United States Navy's Basic Underwater Demolition/SEAL (BUD/S) course. The insignia of the SWG shows an anchor, re-breather and trident over a pair of bat wings, with the motto: "Will to Do, Spirit to Dare". During the Basic Military Training (BMT), recruits learn basic soldiering skills, and build up their stamina and discipline through drills and Physical Training. Enlistees who do not achieve at least National Physical Fitness Award (NAPFA) Silver standard will undergo the Physical Training Phase (PTP) before BMT to build up their level of physical fitness. Basic training includes Drown-Proofing Training, Pool Competency, Fast Roping, Improvised Explosive Device Disruption, Underwater Mine Disposal, Explosive Ordnance Disposal and Special Land Operations. Drown-proofing has its roots from the Vietnam War when it was found that captured United States Navy SEALs were thrown into rivers with their hands and legs bound, and thus drown as they were not trained in drown proofing. Drown proofing teaches Naval Divers to swim with their hands and legs tied. Pool competency is a module to test a Naval Diver's water confidence, as well as the ability to keep calm under hectic situations. There are three parts to pool competency but is mainly an underwater attack. To stimulate such a situation, Instructors will rip off the Diver's face mask and regulator and, depending on the stage of the test, tying them onto the air cylinder. Shoulder straps will be unraveled and the waist belt will be unbuckled. To pass the test, the Diver will have to hold his breath throughout this incident and remedy the situation by getting back his air source and donning the air cylinder in the proper manner. Naval Diver trainees will be trained to ensure nothing stands in their way in the rigorous Combat Diver Course (CDC), which is divided into four phases: Physical Phase, Diving Phase, Land Combat Training and Shipboard Competency. Throughout the CDC, Divers will also go through the rite of passage called "Team Building Week", more infamously known as "Hell Week", where divers are pushed to their ultimate limits physically and mentally, going through revolutions such as cold treatment and 3-kilometer night paddling, while receiving only minimal hours of sleep, sometimes only 3 hours collectively over 5 days. After the "Hell Week", they will be nearing the end of their 9-month training course. This is the Naval Diver Professional Phase. Those who undergo the Warrant Officer/Specialist Career Path will be trained to become highly specialized experts and trainers in their fields. By gaining progressive levels of expertise and leadership, these leaders provide valuable guidance to commanders in their area of specialty. The Combat Advanced Skills Training (CAST) course aims to nurture Naval Divers who have graduated from CDC to be potential leaders in the SAF. CAST also prepares Naval Divers for the Joint Special Forces Qualification Course, by training candidates in basic land combat and building up their physical fitness. The rigorous Special Forces Qualification Course (SFQC) will turn Naval Divers into true warriors of the deep, and masters of the sea, air and land. Special Forces operators are trained in fields such as specialized combat diving, military free-fall and advanced demolitions, to deal with the full spectrum of SAF operations. The Special Warfare Course (SWC) trains NDU's future operators in the highly specialized skills required to operate effectively in the Special Warfare Group. SWC also ensures Naval Divers meet essential requirements, such as water confidence. Those who undergo the Officer Career Path will be trained to inspire and lead brave men and women to mission success. Naval Officers are responsible for completing demanding missions, while ensuring the welfare, morale and professional development of the soldiers under their charge. Selected trainees will enter Officer Cadet School (OCS) to be trained as future Commanders of the SAF. Aspiring young men and women will be developed and nurtured into Naval Officers who are professional and steeped in values, to serve and lead in the Navy. Junior Naval Officers will then hone their leadership skills on board one of the RSN's platforms. Naval Officers may also be given the opportunity to pursue higher education through various scholarship schemes. They can choose between going for further studies or assume starboard appointments. After which, they will go through the Naval Diver Professional Phase. Naval Divers are also regularly sent overseas for training, in particular, with the United States Army Green Berets, U.S. Navy SEALs, British Special Air Service and the Russian Spetsnaz. In 2001, naval officer Captain Wong Foo Chan became the first foreigner to top his class in the Green Berets course, and received a commendation medal for this achievement. He had also completed the Navy SEAL course in 1999. Naval Divers were sent to conduct salvage operations after the crash of SilkAir Flight MI185 on 19 December 1997, which killed all 104 people on board. 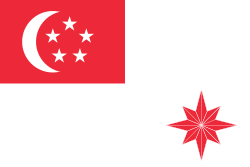 Wikimedia Commons has media related to Naval Diving Unit (Singapore).